"Deer in the headlights," meet "Buhl in the camera lens." 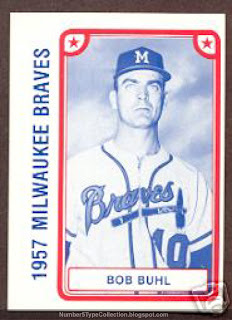 This TCMA set picked a world champion in field performance, the 1957 Milwaukee Braves, but their photo quality leaves something to be desired. Even Bob's Wikipedia page shows off Topps' more humanizing 1958 version. Today's card (scan culled from my eBay win) self-consciously minimizes the pain by dedicating almost a third of the card to non-photo details. Still, that's a heck of a gaze...or stare...or flashback to some failed Bill Veeck promotion. My dad turned 10 on a Wisconsin dairy farm the year they won the series and knows this team inside-and-out. In the history of fatherly gift-giving, kids often default to ties, cologne, or gas for the lawn mower. About a decade ago (and on the spur of the moment), I picked up the 1957 Topps team set and put it into 3-by-3 card frames. The cards still hang next to his desk and, as far as I know, they're the top present from my 30-something years on the planet. Not sure if it works on every old man out there, but it sure breaks up the monotony of never knowing what the heck to get for someone.